The Telefunken V672 was originally designed as universal amp. This one (V672D=2 x V672a) was wired to micpre application and has a gain of 55 dB (minimum +28 dB), linear frequency response and it sounds near to the V676 & V676a. The two modules were built into a new lunchbox (Hammond steel housing) with XLR in & out + an external power supply (100V - 240V). 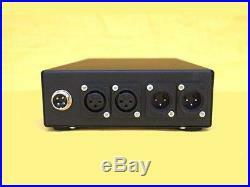 The lunchbox has the additional features: volume, -28dB PAD, phase reverse and phantom power switchable per channel. This Telefunken pre sounds really good: warm, natural and transparent with a little portion of nice coloring which is probably caused by the super high quality Haufe input and output transformers. The unit is not on stock. It will be produced when it sell here and the production time is about 12 days! See also my other auctions!! 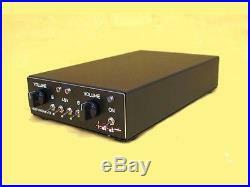 The item "Telefunken Dual Micpre V672 Lunchbox phantom power phase rev. PSU" is in sale since Tuesday, May 30, 2017. This item is in the category "Musical Instruments & Gear\Pro Audio Equipment\Preamps & Channel Strips". 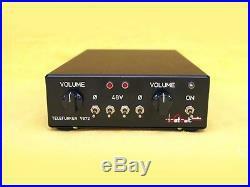 The seller is "velvet_audio" and is located in Hamburg. This item can be shipped to North, South, or Latin America, all countries in Europe, all countries in continental Asia, Australia.